Environmentally Friendly Bike Law in New York Coming Through! Office workers now have one more reason to lower their commute’s carbon footprint: New York City has just passed a new environmentally friendly law allowing cyclists to park their bikes inside their office buildings. The new Bicycle Access to Office Buildings Law is designed to increase bicycle commuting, by giving cyclists access to protected parking while at work. The Queens Courier reports that commuter cycling in New York has doubled from 2005 to 26 percent this year, a green office habit that the government is eager to encourage. “From my vantage point, it’s a huge positive,” said Larry A. Silverstein, president and chief executive of Silverstein Properties. […] Although no bike was leaning against his desk that day, Mr. Silverstein said he supported the new law and thought most buildings with freight elevators could comply and that tenants could handle the parking once bikes rolled through their doors. The new law goes into effect on December 11. More information at the official New York City Hall homepage. Modular Furniture – Godsend for Facility Managers. Facility managers take note – modular furniture is your friend. Today’s Facility Manager chimes in with some useful tips for managing office furniture, when the time comes to move ’em around your territory. Furniture that can be easily moved around is key. Ease of disassembly is another attractive characteristic for many FM’s. And it’s worth noting that this advantage is not limited to chairs, desks, storage, and the like. Wait, isn’t modular furniture expensive? Not anymore; one side-effect of the recession is a glut in used office furniture, and a corresponding surfeit of remanufactured office furniture that’s practically indistinguishable from brand new, but comes at a lower cost. This provides an advantage for the facility manager with one eye to the future, and another on his bottom line. Adaptability: such furniture can be reconfigured to serve a variety of job types. They can be adapted to current usage, or put away when downsizing or restructuring occurs. Compatibility: remanufactured office furniture catalogs allow facility managers to match newly-purchased furniture to existing product lines – minimizing the mismatch that often comes when the manager has to wait long periods before purchasing new furniture. Customization: remanufactured office furniture allows a high degree of customization when called for. Call center operators and vice presidents have very different needs – a facility manager ought to be able to provide for the needs of both. Mona Hoffman, vice president of marketing at Kimball Office in Jasper, IN, notes the way the wind is blowing for facility managers. “There is a need for multipurpose products that easily adapt to changing footprints and flex with the flow of people and projects,” Hoffman reports. Is your intel on ergonomics accurate? New discoveries in ergonomic science may have made your old ideas on office ergonomics obsolete. Monitor distance – the old wisdom was that a monitor should be 18-24 inches away. Actually, longer distances relax the eyes – so the ideal distance is actually further than two feet away. Keep the monitor far from your eyes, but close enough to read the text. Chair placement – people used to believe that the chair’s height should allow the feet to reach the floor, assuming the legs are bent at a 90-degree angle. While this angle isn’t necessarily uncomfortable or harmful, the legs shouldn’t be expected to be nailed down in that single position all the time. The chair should simply be expected to be low enough for the feet to rest on the floor, period. Posture – formerly, ergonomics books recommended an upright posture, hips perfectly perpendicular to the legs. Now, a wider hip angle seems to be more in line with natural ergonomics – optimally, the hips should be angled at 130 degrees. This aligns the vertebrae to ease the pressure on the intervertebral discs. Sitting at a recline is also better than sitting upright, as this position eases the strain on your lower back muscles and lightens the load on your spine. 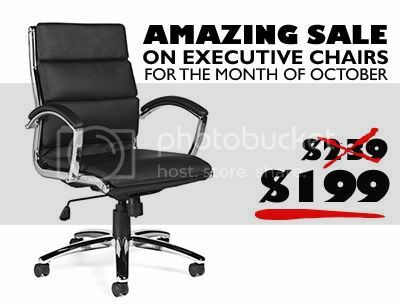 Special Seating Deal this October! Forget about ghosts and goblins this Halloween. You know what’s really scary? Lumbar pains, especially when they strike the executive workforce. If you’re the guy who made the decision to buy the chairs in the office, the suits will blame you for their lowered productivity and increased suffering. Luckily, there’s a way to correct the situation.